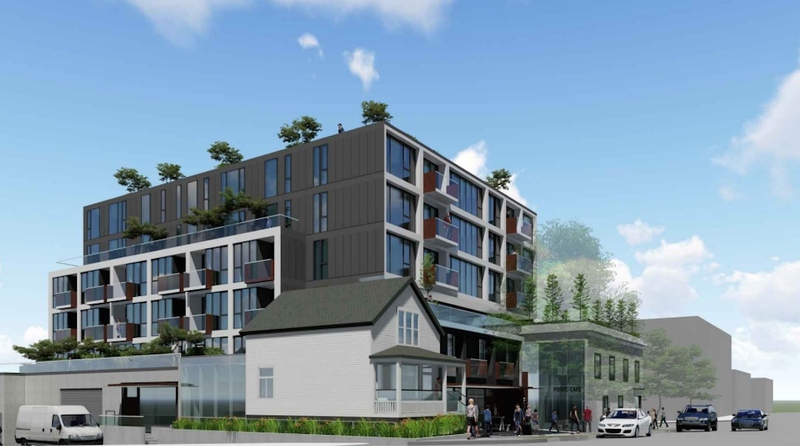 A plan for a new architecturally unique mixed-use commercial development in Vancouver’s Mount Pleasant has advanced to the leasing phase, and it has the potential to become quite the attraction on its own in the district. 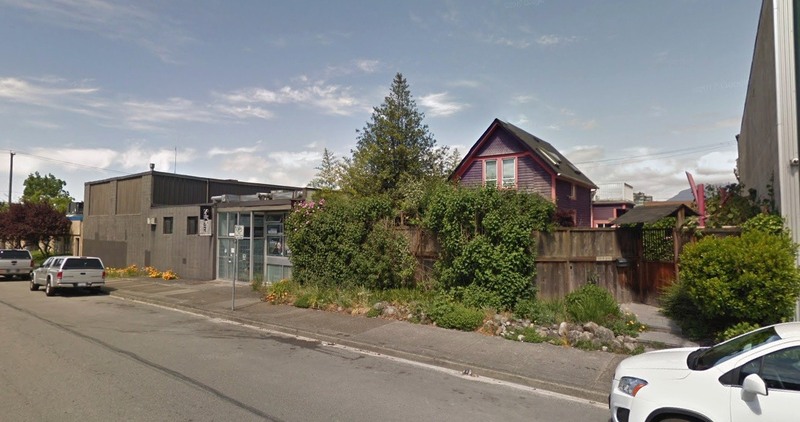 In late-2017, local developer Conwest Group submitted a development application to the municipal government for the site at 37 West 6th Avenue to construct a building with office and industrial spaces. The project is located on a large mid-block site on the north side of West 6th Avenue between Manitoba Street and Ontario Street. 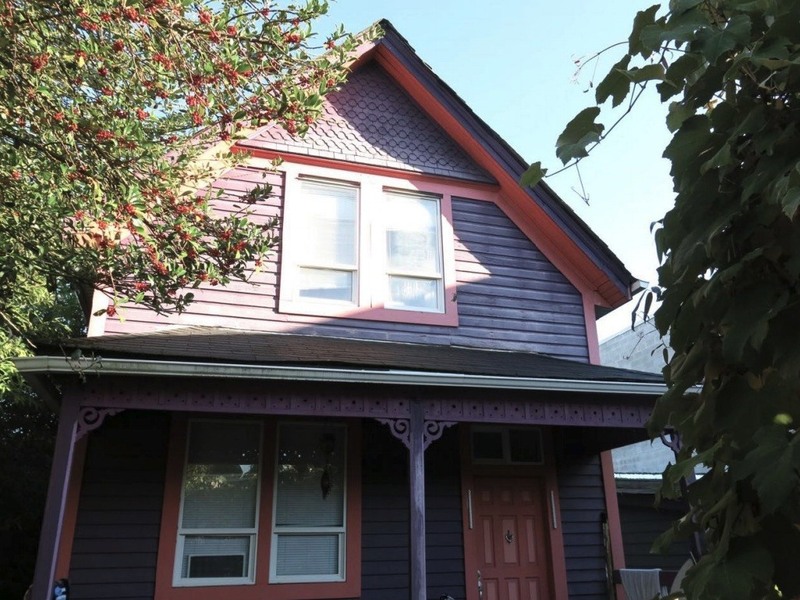 It will incorporate a heritage home — the so-called Coulter House, built in 1901, currently located closer to the northeast corner of the site. When construction begins, the wooden home will be relocated closer to the southwest corner of the property and integrated into the new modern building to become the main entrance and defining feature of the ground-level restaurant space. In laymen’s terms, yes, this will be Vancouver’s very own ‘real-life’ house from the Disney Pixar movie Up — minus the mass of hovering helium balloons. A new artistic rendering of the development also provides further detail on the architecture of the project. According to the design rationale by Yamamoto Architecture, the heritage home is the building’s “centrepiece” as it organizes the composition of the building into three volumes, with a three-storey volume to the east, a two-storey volume spanning the site containing the upper two floors, and a recessed volume with the home and building’s main entrance. Special lighting will illuminate the house during nighttime. “The three main volumes of the building are expressed as simple glass boxes that are meant to provide a simple, clean backdrop to the heritage house,” reads the rationale. 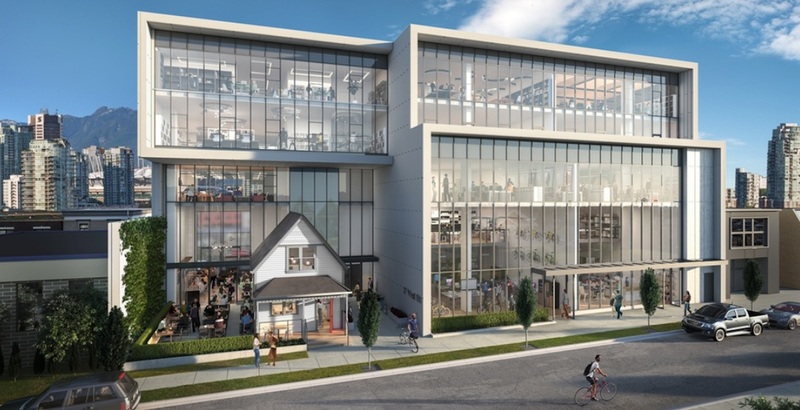 The property has 47,165-sq-ft of leasable commercial area, with 3,000-sq-ft of restaurant space and 16,000-sq-ft of creative industrial and light manufacturing space on the ground and mezzanine levels and over 31,000-sq-ft of office space on the upper levels. Building amenities for workers include a large top floor outdoor patio with views of the downtown skyline and mountains. If all goes as planned with construction, the new development will be ready for occupation by early-2021. 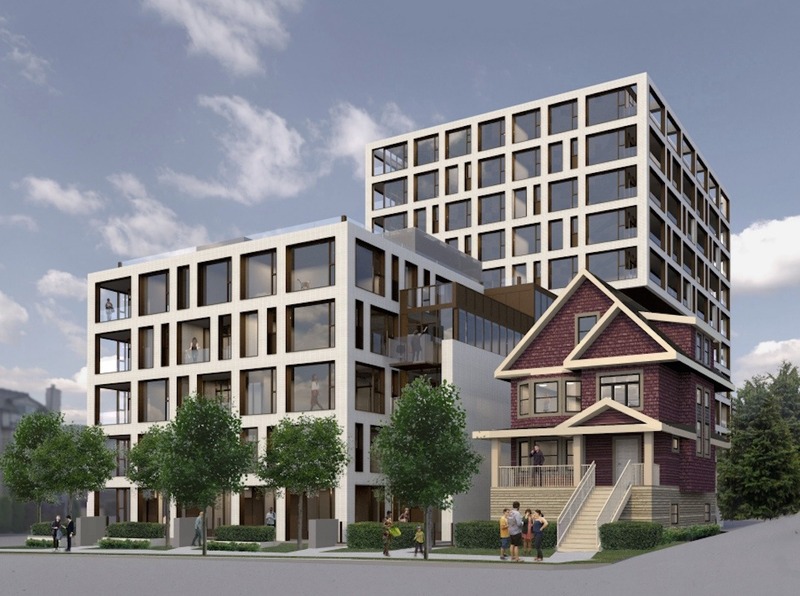 Other upcoming projects in Vancouver that also incorporate heritage character homes into their contemporary designs include a six-storey retail and residential building at 2525 Carolina Street and an 11-storey, 138-home building at 2685 Victoria Drive near Commercial-Broadway Station.